I'm a freelance writer and photographer living in Melbourne. I'm passionate about the wellbeing of our planet & all its inhabitants. Lover of the Arts, music, nature and the beauty of the human spirit. 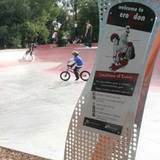 Hey kids, young or old, hold onto your skateboards, scooters, bikes or whatever wheels is your thing – and head to Croydon Skate Park or Croydon Youth Space, as it is also known. A popular spot, Croydon Y Space boasts a fantastic skate area covering 1100m2 which includes: mini ramps, an open ended bowl and a concrete activity court. It is located in Croydon Park, a spacious green environment with lush trees that provide shade and bench seats for resting. On the same site there is a children's playground, BBQ, toilets and a walking track. Exciting to locals and visitors of this much enjoyed recreation area is the news of the future expansion of the site. Maroondah Mayor, Councillor Les Willmott has confirmed that council is in its final stages of design and construction is expected to begin in mid 2014. A junior climbing unit with slide under the shelter with other climbing elements, climbing nets, 5 way swing set, basket swing, large double see-saw, spinning cup, spinning disc. What makes this spot even more appealing is the convenient location of nearby shops and other facilities, with Main Street Croydon, and Croydon Station only metres away. Directly opposite the park is Arndale Shopping Centre which has a Woolies, Chemist, Newsagent, Bakery and Café amongst other shops. On opposite ends of Y Space, you will find The Croydon Pool and Croydon Library. Already labelled "The sickest park" by local skaters, it seems the best is yet to come for Y Space. Watch this Space!